She’s named for the goddess of wisdom, courage and inspiration, but our petite retriever/mix Athena embodies these traits easily and blows right by — she’s more a super-charged playmate than a regal entity, and the reality of her down-home affection is so much warmer than any myth. 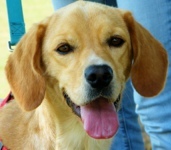 Athena was found stray but she’s already been spayed; some forlorn family’s lost their lovely 4-year-old golden girl. At 37 lbs. she’s a perfect-sized inside/outside companion for big kids and canine friends, too — playing tug of war with another dog is her favorite past time, second only to basking in your attention. Although she hangs on your every word, young Athena could benefit from a little training, she’s naturally tidy and gentle but her affection seems to know no bounds, and her pure, rollicking heart bears no resemblance to the cold marble reserve of her Greek statue namesake. Come stroke our smiling, silky-eared goddess, and see how much fun it is to be ruled by her legendary golden retriever-love. She’ll cross her cage in a second to pay you the welcoming attention you deserve, because 11 month old Violet’s actually more of an “ultra-Violet” than a shrinking Violet, as long as the “ultra” is for ultra-loving. Pretty Violet was found stray, a modest, well-groomed tabby girl who’ll never grow to be big, gifted with lavishly affectionate ways — a strong-loving friend devoted to you instantly, ready to bestow a deliciously emphatic rub, an excited sing-song purr and an entire series of head-butts, with plenty more to come. Violet’s a cooperative family member — she’s popular with other cats and her box is model-tidy. She demands little and gives infinitely, would make an ideal inside/outside cat, and a gentle, appreciative pet for kids. Come feel the warmth of her first dainty kiss, and how her amber eyes shine with her heart’s glow when she shows you how special you really are. She rolls on her back submissively at first, but then the real Sasha shines through — 30 lbs. 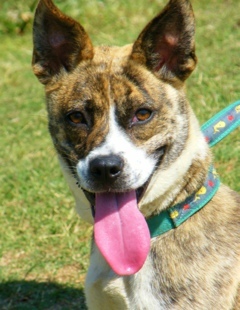 of brindle Shepherd/mix beauty, gentle, well-formed, intelligent and loving, ready to run gleefully with her dog playmates, then land tenderly in your arms. 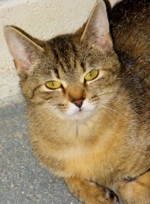 Sasha was found stray in Greenwood, a naturally civilized year and a half year old living on the streets, just waiting for the right person to prove herself to. Smiling Sasha knows her behavioral boundaries instinctively; she loves to listen and seems aching to be trained, she’s eager to please, responsive and quick to learn. Her compact size makes her a great inside dog, her ginormous heart and trustworthy ways make her the companion of a lifetime for your kids. Come look into her perceptive face and see your family’s future, one brimming with Brindle devotion, the kind only Sasha can bring. Look up “Cat Simpatico” and you’re sure to see her picture, because Tiffy’s as richly pleasing a feline as you’ll find — filled with loving purrs and swimming with social grace; the consummate inside cat, declawed on all four of her gentle paws. 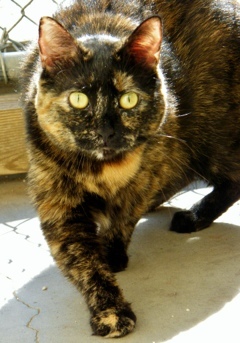 Her Torti-cat coat’s as gorgeous as her heart is sweet — soft, thick and deep plush, ebony black shot through with gold; legend says that Tortis bring good luck, but 5-year-young Tiffy’s deliberately kind and leaves nothing to chance; her patience makes her an ideal choice for kids. Tiffy’s owner turned her in regretfully with 2 sister cats, a surprise pet deposit was just too steep. Her manners here are as fine as ever; she befriends other cats, keeps a neat box, and adores a nice brushing — and although she’s an inside cat, she loves to lie in the sun, the better to make her black and gold coat glitter. Come feel the warmth of a perfect snuggle, bestowed by a perfectly flawless friend.